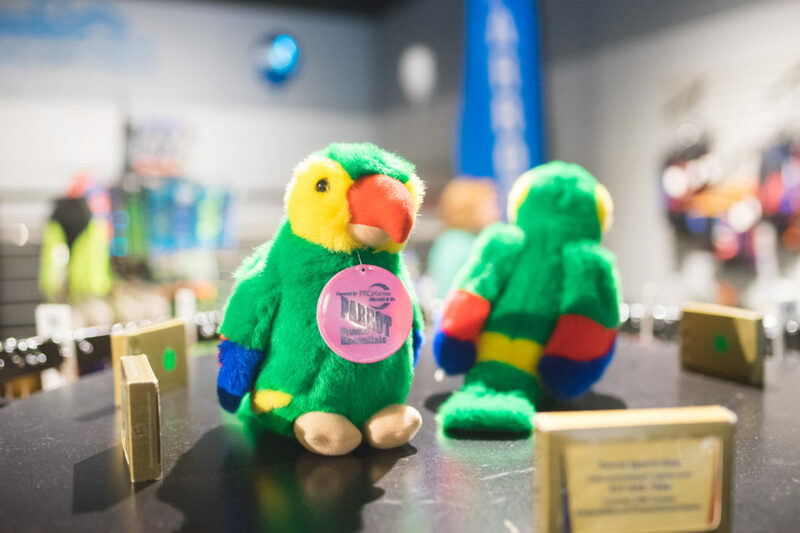 Penelope is the plush Puerto Rican Parrot mascot here at Parrot Sports Gear! She interns with a new local-Dayton company every week and shares her experiences with the world on social media. Penelope is a stuffed animal Puerto Rican Parrot (Amazona vittata), which happens to be is one of the rarest birds in the world. Puerto Rican Parrots can only be found on the island of Puerto Rico. Historically, Penelope’s kind was widespread and abundant in mature forests all throughout Puerto Rico and on several nearby islands, but the destruction of most if its habitat and poaching in the 19th and early 20th centuries drastically reduced its population. The parrot was listed as endangered and conservation efforts began in 1968 to keep the species from going extinct. At an all-time low of just 13 in 1975, the wild flock is currently climbing, but its future is still undetermined. There are a total of 79 adult birds in captivity in the aviaries of the El Yunque National Forest and Rio Abajo State Reserve. The remaining parrots are constantly monitored and managed through a cooperative effort between the Forest Service, the U.S. Fish and Wildlife Service and the Puerto Rican Department of Natural Resources. The Puerto Rican Parrot is bright green with a red forehead, blue primary wing feathers and a flesh-colored bill and feet. About a foot in length, these colorful birds feed mostly on wild fruits, particularly the Sierra Palm, but also consume flowers and tender shoots. During October when fruits are scarce, they turn to the Tabonuco Fruit. Apply today for the opportunity to adopt Penelope! This entry was posted in Promotional Items and tagged penelope, promotional items.